There was interesting news reported yesterday that the Dodgers are attempting to reach an agreement with right handed reliever Chin-hui Tsao, who has been out of MLB for over five years. Reports are that Tsao is throwing his fastball in the mid-90s, at the ripe old age of 34. Those excited about the proposed signing should probably hold back their enthusiasm. Tsao was suspended for life from the Taiwan Baseball League (CPBL) for match fixing and accepting bribes from gamblers. Never convicted, nonetheless, Tsao received the permanent ban in Kennisaw Landis fashion from the CPBL. He has languished outside of organized baseball ever since. Suspended after the CPBL Championship Series, in which he was the losing pitcher of the 7th game of the series. Allegations claim he was engaged in accepting unsuitable benefits from gamblers in August of that very season. Later after being suspended by the CPBL, Tsao ran into hot water in 2013 in an embezzlement scheme with his restaurant, an allegation made public by his estranged girlfriend in litigation that has not yet been resolved. 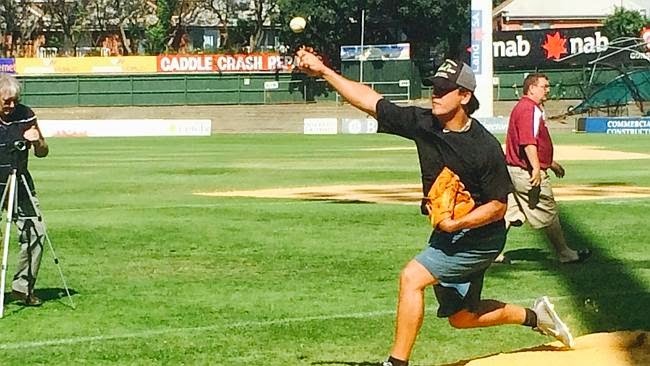 Tsao attempted to make a comeback in the Australian Baseball League last year, but the ABL decided to suspend him as well after meeting with CPBL officials who presented their evidence for the lifetime ban. All the facts of the case have not been made public, but they must be rather severe for such harsh decisions to be made. If Tsao is reinstated and allowed to play Major League Baseball, the decision would be rather unprecedented. First, because MLB would risk it's friendly relationship with the CPBL, which is something MLB has been cultivating for years. Second, because MLB has NEVER tolerated even the hint of players associated with gambling. If by some miracle Tsao is allowed in, watch for Pete Rose to speak openly about it. Reality is that Rose will probably be Tsao's greatest fan for reinstatement as it would most likely open the door for him as well. I honestly don't see this happening, but who knows? Maybe Bud Selig's replacement, Ron Manfred, will opine on the side of leniency. In this topsy turvy world of following the Dodgers, it's almost as if we are watching a soap opera with the dynamic turns of events. Kemp is gone, then maybe not. Then the teams are working out another package due to his arthritic hips. Oops! No, the original deal is back on again. This is crazy. Rather than update things, I'm finding that it is simply best to wait until the teams make the formal announcements of the trades, which should be happening as soon as Friday. Sources from the L.A. Times, ESPN, and MLB network are saying that Kemp and Fedex are now Padres and Grandal and Weiland are now Dodgers. This means that Rollins will be a Dodger and Eflin will be a Phillie. There are more names probably, but as I said, it'll be best to wait until the dust clears and the announcements are made. What continues to be unsettled is the glut of Dodger outfielders that remain on the roster. They include Chris Heisey, Scott Van Slyke, Carl Crawford, Andre Ethier, Scott Pederson, and Yasiel Puig. Watch for two of those six to be moved before spring training. The organization's willingness to part with players owed huge sums of money leads many to believe that a player like Andre Ether could be on his way out with the Dodgers paying the majority of the $73.5 million he is owed over the next four years. It is probably safe to say that the Dodgers would have to agree to pick up about $45 to 50 million of that contract, as Ethier's depleting numbers make him a hard sell. An American League team with a short right field porch might be an attractive landing spot for him. Perhaps New York or Texas could be a fit, but it would be shocking to see the Dodgers obtain anything of value in return. Carl Crawford is owed $62.2 million through 2017 and he's another practically immovable piece that probably remains in blue due to that contract. Perhaps that's good though, as Crawford appears to be one of the lone Dodger pieces remaining that has speed. He swept 23 bags in only 105 games last year, and it is expected that he, along with 36 year old Jimmy Rollins, will be the only real stolen base threats on the club now that Dee Gordon is a Marlin. So that leaves Van Slyke, Pederson, Puig and Heisey. Of the quartet, I'm thinking that Van Slyke may be the player that is moved. That's unfortunate, as Scott has shown signs of brilliance and has never been given a full time shot. Unfortunately, the numbers game has caught up to him. Heisey was acquired because of his versatile defense and pinch hitting skills. Pederson is the new centerfielder and Puig continues to be, in my opinion, a player with the ability to be the next Roberto Clemente. 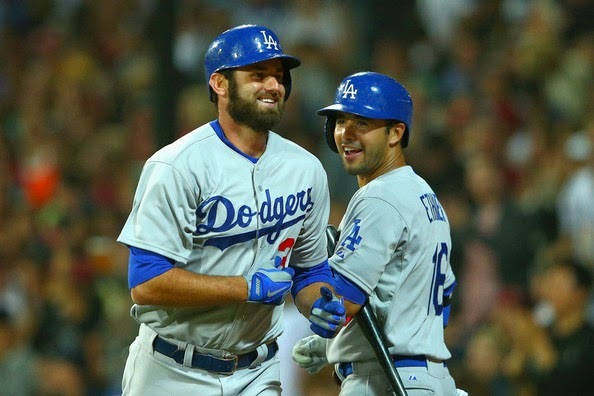 A good match for Van Slyke may be in the A.L. East where he could be seen as a valuable asset to face Wade Miley in Boston. His stat line of .444, 8 for 18, with 5 homers, should be of interest to Baltimore, Toronto or New York. It's rather silly to use that small sample size against a lone pitcher as a selling point, but ownage is ownage, and Scott certainly has it against the new Boston starter. Van Slyke was solid in his 98 games last season, hitting .297 with a .387 OBP and .524 slugging percentage. He smacked 11 homers over 212 at bats and showed that he could handle all three outfield slots and an additional first base assignment. This is a valuable player to have on a ball club, and added to that his salary comes in at the major league minimum. Scott will be 28 years old this season, and it wouldn't be a surprise to see him really emerge this season. I hate to see him go, as he could be the one guy that someone could really steal from the Dodgers this off-season. Sabermetrically speaking, Van Slyke is the type of player that guys like Friedman and Zaidi like to acquire. There's simply no room for him, unless the Dodgers magically are able to rid themselves of both Ethier and Crawford. That Looks unlikely, but perhaps the new front office, affectionately monikered the "geek squad," has something up their sleeves. We just experienced the nuttiest 14 hours in Dodger history and it's not over yet. Everything I wrote about Zaidi and Friedman in the previous post is completely to the window. One thing we now know, if Farhan moves his lips, he's probably lying. Less than 24 hours after dispelling rumors of a Dee Gordon trade by saying that he is their "cost controlled" second baseman, he was traded. Less than five days after telling the world that right handed power bats are hard to come by and that Matt Kemp was the best hitter in the league in the second half of the season, he was traded. 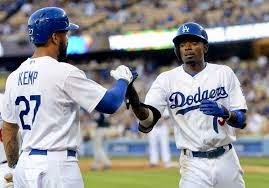 Matt Kemp and Dee Gordon were both traded within 12 hours of each other. The M.O. of the Dodger administration has emerged. It's peddle off a player when his perception in the league is high. Gordon, coming off an All Star season and Kemp, after recovering from injuries in the second half. It's probably a wise way to run a club. Fans with strong emotional ties to the players won't be happy, but it's important to remember that the Kemp contract was inherited, and that isn't Zaidi and Freidman's fault. There are so many names that were involved in trades, I hope I have them right. The Dodgers traded Dee Gordon, Dan Haren, and Mel Rojas, (additionally agreeing to pay their 2015 salaries, $13 million) to the Miami Marlins for LHP starter Andrew Heaney, Right handed deliver Chris Hatcher, infielder Enrique Hernandez and C/IF Austin Barnes. Then they traded Heaney, a highly touted starter who was the number 9 overall pick in the 2012 draft to the Angels for their all star second baseman, Howie Kendrick. Earlier in the day it was reported that the Dodgers had acquired Jimmy Rollins from the Phillies for two pitchers, who are yet to be un-named. The Phillies are reported to have included cash in the deal. Quantity unknown at this time. Lastly, Dodger fans woke this morning to the news that Matt Kemp, Tim Federowicz and $31 million have been traded to the Padres for Catcher Yasmani Grandal, and pitchers Joe Weiland and Zach Elfin. Is that it? Apparently not. 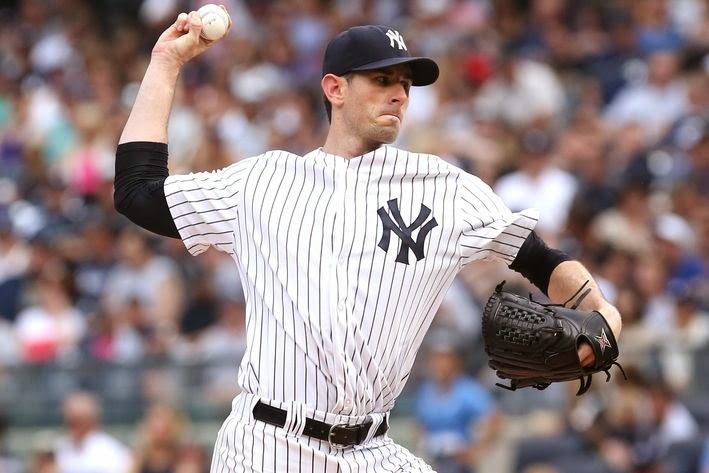 Reports this morning are that the Dodgers are close to a 4-year /$48 million deal with RHP Brandon McCarthy. With the 40 man roster now sitting at over 43 players, (I've lost count) it is assumed that another trade is in the works. Now with prospects stocked in the organization and money freed up, speculation is that the Dodgers can pull the trigger on a Cole Hamels deal. It has been a stunning day and the Dodgers are being completely revamped. Stay tuned, but be sure to fasten your seat belt. Craziest day ever. A few years back when the MLB network debuted, I was giddy with excitement. What can be better than baseball 24/7/365? Now three years into the channel I am beginning to feel otherwise. With Plesac, Reynolds, MaGrane, DeRosa, Byrnes and others constantly feeding us information, it's enough to make your head explode. A good portion of those mentioned have said Matt Kemp is on his way to one of these destinations: Texas, Seattle, Baltimore, Boston, and San Diego. It's enough to drive you mad. Those guys are simply speculating and spreading rumors coming usually from no-where. For those concerned about many Dodger rumors, especially that Matt Kemp is about to head to another location, it is highly suggested that these quotes from Dodger G.M. 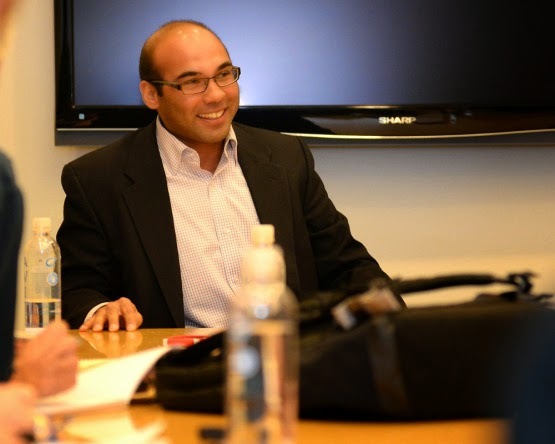 Farhan Zaidi made on air at AM 570 from last Friday be read and reread. Zaidi could be an excellent poker player, and maybe he's playing us all, but his level headed comments seemed convincing. The Dodgers are being run by a competent group that isn't going to gut the franchise into a non-contender. In a previous piece I said that I thought they might be in payroll reduction mode, but after listening to Zaidi, I'm starting to believe that the front office is simply smarter than ever before and will do all they can to put a winner on the field now. Zaidi's quotes follow. "We have a surplus of outfielders and there's some demand out there from other teams. Offense is pretty scarce in Major League baseball, certainly in the last couple of years. So a guy like Andre (Ether) could be a fit for a number of teams. including our own. So we're just continuing to look at those opportunities as they come across the table for us. If there's something that makes sense for the Dodgers, we'll pursue it." "Matt Kemp was the best player in the National League in the second half. If anyone wants to challenge me on that, I have all of the numbers to back it up. It's the hot stove. People need something to write about everyday. We're aware that there's a desperate desire for content out there, and frankly it's not just the desire for content, but some of the stuff you read about free agents, I'm telling you, going from Oakland to L.A., I've never been more popular with agents in my life..."
"Matt (Kemp) is a terrific player. We are well aware of how important he is to the team, but we were brought in with some specific goals in mind and with very high expectations. And part of our responsibility is to just look at everything..."
"We have financial resources at our disposal. I was asked earlier, 'who are you going to pursue?' and my answer was 'everybody.' To me that's part of the difference between being in Oakland and being in L.A. I could sleep well at night in Oakland knowing that I wouldn't have to wonder if a certain player was worth $100-150 million dollars. Now there's some sleepless nights because those are all decisions that we have to look at. It's kind of like the answer that I gave when I was asked about Matt (Kemp). It's that you have to look at everything, and particularly when you are looking at a guy that is at an elite level, that every team could use. " "We have a little problem with our starting pitching depth and we've started to adjust with some smaller moves. It's always a good idea if you're a baseball team to add pitchers at the front of your rotation than at the back..."
"At Oakland...there was just a whole group of players you didn't have to think about. The more resources you have at your disposal, the more complicated the cost benefits analysis gets on every move. We're in a position where we have to think about the luxury tax in baseball, the competitive balance tax implications that that has for us. So I actually think it's more complicated. The more money you have at your disposal, the bigger chance mistakes will be made. We understand the challenge ahead and we are in a position where the expectations are great, the challenges are great and we hope that the reward is also great. So that's our perspective." "Right handed power is a scarcity at this time, and that's what Hanley brought to this team last year. That's what Matt Kemp continues to bring to this team, and that's probably the most difficult thing to replace. I do think that as we look to fill the shortstop position, we're maybe able to reorient that position to being a more defensive position. Looking to some guys that really contribute defensively at short... This gives us a chance to get a really plus defender at short, that will really help our pitching staff. We're viewing it as an opportunity to upgrade defensively and we believe that will compensate for the loss of offense." We all know it's difficult to slow down and gawk at the car accident ahead of you as you drive by, but that is what the MLB network is at the moment, (and twitter rumors as well). Look if you must, but you probably won't like what you see. Zaidi has spelled out the Dodger front offices direction in a short 15 minute segment. It's best to listen to his words, because the wonks at MLB network are running with stories that often don't have any legs.